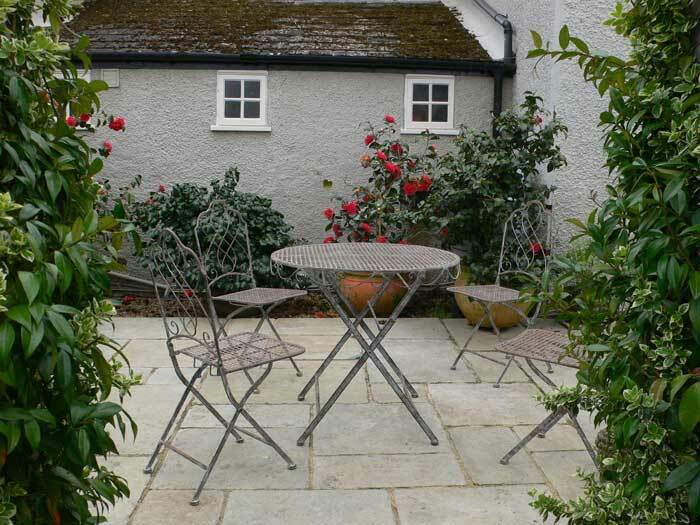 When the switch from indoors to outdoors and back again is seamless, the garden seems more inviting and more useable. Here are some landscaping ideas that will get you and your family outdoors and enjoying the garden. A good landscape gardener understands that garden design is not about taking a 2D piece of paper and arranging garden features so they all fit on the plot. It’s about creating views and vistas that make you want to go outside. Landscaping design definitely begins inside the building and takes a holistic view of the home, garden and lifestyle. Good design starts by considering what can be seen from each window and accessed from each door. 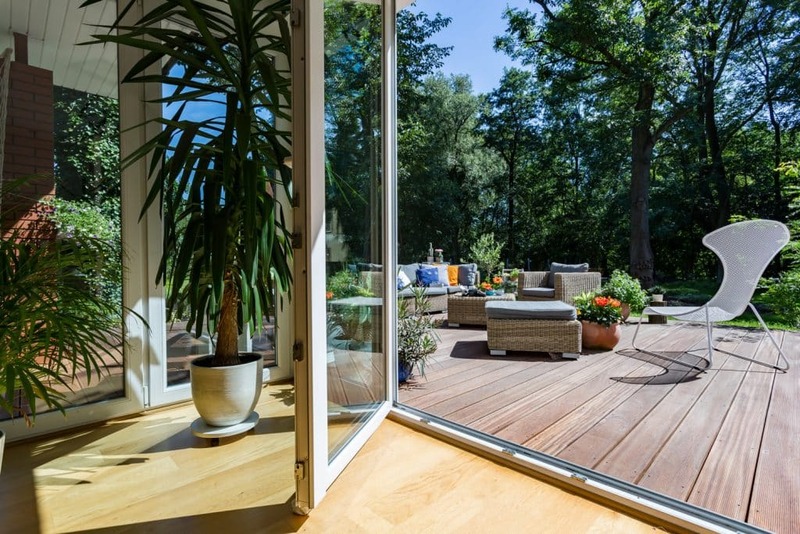 Bi-fold doors are great but definitely not essential when you want to integrate your outdoor and indoor spaces. For example. If you can see a beautiful seating area from your window, you’ll want to take your morning coffee outdoors and sit a while. Even on chilly days, spending 15 minutes in a sheltered bower listening to the birds and breathing in the fresh air (even if it is with your coat slung round your shoulders) can make a huge difference to your general wellbeing. As understand it, it also will top up your vitamin D levels. If your back door opens directly onto a muddy lawn, you’ll probably avoid the garden in order to keep the house clean. Landscaping is about practicality with a sprinkle of human psychology. A vital step to integrate your outdoor and indoor spaces is to make sure that the garden looks inviting from inside the house. It must beckon you out. Clever garden design and landscaping can disguise ugly views, create privacy and craft interesting features. Landscaping can make your garden feel like home. Reducing barriers will help to integrate your outdoor and indoor spaces. Barriers can be physical – like brick walls, or they can be perceived. For example, using the same flooring materials and colours indoors and outdoors fools your eye to thinking you are in the same space. When there’s a big strong contrast in the flooring your brain registers that you are moving from one space into another. The same concept applies to levels. Stepping through a doorway without negotiating reinforces that feeling of moving from one part of a space into another, rather than leaving a place and going into another place. Steps or a change of level can be a huge barrier to somebody with mobility problems or somebody carrying drinks and food. The landscaping options for flooring are endless and levels are rarely an issue. A good landscape contractor can create a deck, a terrace or a patio that flows seamlessly from indoors to outdoors and doesn’t affect the damp course or the drainage for your home. When you think of outdoors, you probably think of somewhere with no roof. A place that is completely open to the elements. But it needn’t be that way. A porch or a pergola can form a halfway house between outdoors and indoors. Not fully enclosed, but still sheltered from the elements. Why not use a pergola to join two or more structures? A bit like an outdoor hallway or corridor. To my mind, the main difference between indoors and outdoors (apart from the weather) is privacy. Indoors feels protected and secure. You have control over who sees or hears what’s going on indoors. Outside is more exposed and that can feel a little uncomfortable. Especially if you are the sort of person who likes peace and quiet. Would you be more inclined to use your outdoor space if it felt more private? Why not use screening or planting to make a secluded spot where you are hidden from the outside world? This design by Tapestry Design Studios ties the indoors to the outdoors. Just imagine the view from those patio doors and look how many features there are to intice you out of doors. You could prepare your lunch indoors and eat it on the terrace. Or you could host the perfect indoors-outdoors party. With imaginative landscaping, it’s really possible to embrace the concept of outdoor living. And you don’t need a huge garden to do it in. Even a courtyard can have some fabulous features integrate your outdoor and indoor spaces and to make the most of the whole of your property. If you enjoy outdoor cooking, al fresco eating and entertaining you really don’t need to settle for a gas BBQ plonked outside the back door. Those indoor-outdoor parties are a synch when the landscaping is just-so. Imagine throwing the doors open so that your guests can smell delicious smells coming from the purpose built outdoor kitchen. 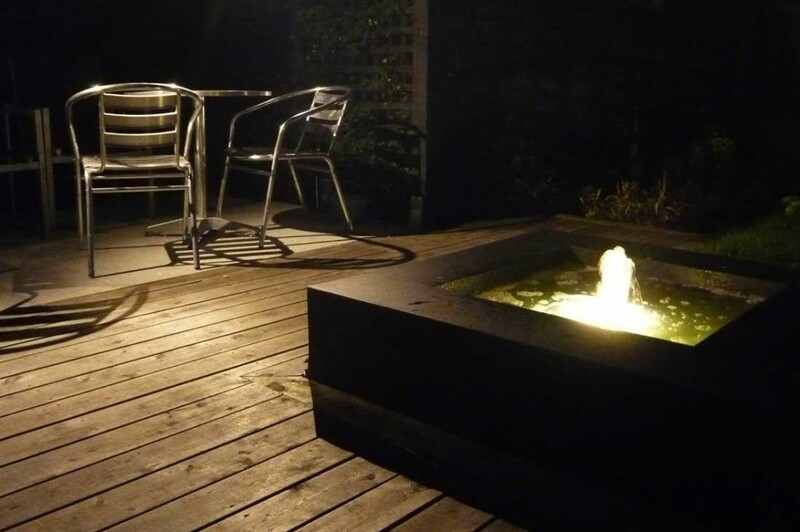 They can feel the warmth from the outdoor fireplace and be intrigued by the clever lighting. Comfy seating in a cosy setting surrounded by lush planting will entice them out and they’ll still be there, long after the meal has been eaten and the sun has left the sky. That’s what we mean when we talk about integrating your outdoor and indoor spaces. How will you integrate your indoor and outdoor space? Why have your garden built by a professional landscaper?